Dubai, United Arab Emirates, 29 August 2018: Land Rover has embarked on an unexpected expedition to preserve the precious African rhinoceros and its habitat by joining an urban rhino trail across London. A gleaming Land Rover rhino model, embellished by Land Rover’s Chief Design Officer Gerry McGovern, made its debut in central London in the latest collaboration of a 15-year relationship with Tusk. The unique 1.2m-long rhino sculpture was towed into Trafalgar Square in support of the Tusk Rhino Trail, to aid conservation projects for the endangered species. The initiative involves 21 sculptures donated and decorated by leading figures from the worlds of art and design installed at prominent locations across the capital. The design of the Land Rover rhino uses specialist paint techniques from Land Rover’s state-of-the-art manufacturing process to achieve a highly durable liquid metal finish. Traditionally chrome has been used on vehicles to communicate prestige. Land Rover has developed an innovative and sustainable process to create a modern interpretation of chrome using a paint coating called spray chrome. Inspired by the dye treatments conservationists use to protect rhinos from ivory traders, the horn of the Land Rover sculpture has been painted red, highlighting the plight of this endangered creature. White ivory has huge value to poachers and one solution is to inject rhino horns with a dye, making them less appealing to hunters. 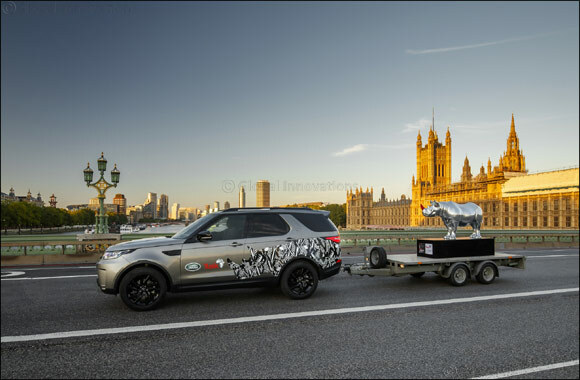 The London-based art installation was towed into place using a Land Rover Discovery SUV and is designed to raise awareness of the plight of the rhino, culminating in the celebration of World Rhino Day on 22 September. Each of the 21 rhinos will then be sold to raise funds for Tusk projects across Africa at an event hosted by leading auction house Christie’s on 9 October.